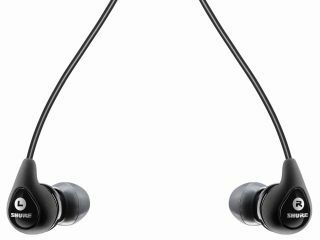 Shure's effective in-ear sound-isolating headphone technology is now available for just £70, following the launch of the SE110 - the brand's most affordable sound-isolating headphone to date. The product breaks new price territory for Shure, whose isolating headphone range extends right up to £330, for the flagship SE530. Evolved from on-stage earphone technology and said to be "road-tested by professional musicians", the SE110 features Shure's Balanced MicroSpeaker technology - the name given to the tiny drivers inside each unit. Originally developed to enable musicians to hear their own performances in loud on-stage environments, sound-isolating earphones work by using soft, pliable sleeves to block out background noise, without resulting in an overspill of music. It enables small, high-performance drivers to deliver sound directly to the ear, protecting hearing through lower volumes and avoiding sound leakage, the bane of all commuters. An assortment of soft, flexible sleeves are provided to get the right fit, and once correctly installed in the ear, the SE110s are said to block over 90 per cent of ambient noise. The headphones come with a carrying case, nozzle cleaning tool and a two-year warranty. An airline adapter, volume control, and Push-To-Hear (PTH) accessory are also available to purchase.